Thomas, P. (2018). General session: public policy updates: what you need to know and how it affects you., presented at American Therapeutic Recreation Association Annual Conference, 2018, Grand Rapids, MI: American Therapeutic Recreation Association. Danny Pettry has been a good-standing member of ATRA since 1999. Pettry is not a hired spokesperson for ATRA. Pettry does not serve on the ATRA board. Pettry is a Lifetime Member of ATRA. Pettry is an advocate for recreational therapy who volunteers with the ATRA public policy team. 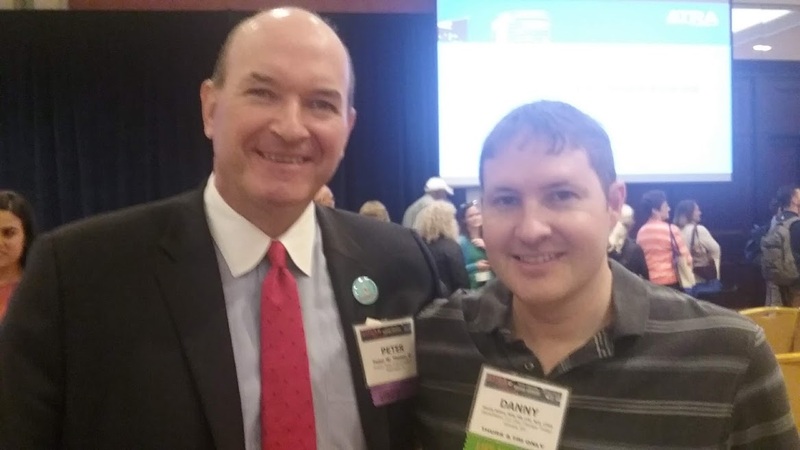 Danny Pettry had the opportunity to attend the 2018 annual conference held by the American Therapeutic Recreation Association (ATRA). It is the largest gathering of recreational therapists. Peter Thomas, JD presented a general session, titled: Public Policy Update: What You Need to know and How It Affects You on Friday, September 14th at this year’s conference. Danny Pettry provides a brief review of this session. Peter Thomas is a disability attorney with Powers Pyles Sutter & Verville. Peter Thomas is very knowledge on healthcare legislation. How did Peter Discover Recreational Therapy? Peter disclosed his personal experience being an amputee from a car wreck. He received treatment in Denver, Colorado. Peter attributes a lot of his success to his recreational therapist who taught him several life skills. Public policy is concerned with legislation. Groups of people get together to advocate and education in attempts influence public policy. Why is Public Policy important to Recreational Therapy? Other professional organizations have a seat at the table because they have lobbyist in Washington, D.C. advocating for their own profession. Their lobbyist influence legislation. If Recreational therapy services might get cut from federal funding if recreational therapists are not sitting at the table. It is vital for recreational therapists to be involved in public policy. Fortunately, Recreational Therapists have a lobbyist. Peter Thomas is the American Therapeutic Recreation Association (ATRA) Legislative Counsel. Peter has worked on numerous ATRA initiatives on the behalf of recreational therapists. However, Peter can’t do it alone. It is up to every single recreational therapist to be involved in public policy. Health care changes a lot. Peter Thomas shared some of the current trends in Washington, D.C. related to health care, disability services, and recreational therapist. In regards to delivery of services and payments: there is a focus on: decreasing costs of care and keeping people out of the hospital. Physicians are paid for performance with merit based incentive plan. This incudes, Physical Therapists. Occupational Therapists, Clinical Social Workers, and Clinical Psychologists. There is a proposal for increased money for simple care, which is not good for the disability community. Bundle payment models: has a flaw that it lacks measure son functional improvement and patient satisfaction. You can save money in the short-run, but it is not effective in the long-term because a patient may be re-admitted sooner. Healthcare, like education has a lot of regulations because they receive a lot of government money. Regulatory relief consists of reducing the burden of regulation. ATRA is trying to get the committee to adopt H.R. 626. This is a bi-partisan House bill sponsored by G. T. Thompson (R-PA) and G.K. Butterfield (D-NC) introduced this legislation to help Medicare beneficiaries obtain Recreational Therapy services in Inpatient Rehabilitations Facilities (RF) by counting Recreational Therapy towards the (3-hour rule) when medically necessary. The 3-hour rule is: This rule requires the patient to be able to participate in three hours of rehabilitation therapy per day, five days per week, or 15 hours of rehabilitation therapy over a one-week period. This bill has a lot of support from many groups. Recreational therapy isn’t to be provided for every patient, but just those who need it (like speech or orthopedics). The attending physician can determine if recreational therapy is necessary for a patient’s treatment in IRF. This still a big uphill battle. If recreational therapy can be recognized in IRF settings then it (Recreational Therapy) can be recognized in other settings too. Problem: Recreational therapy isn’t something Capitol Hill understands. (The profession has an identify issue because it is not well-known to those outside of the profession). Peter Thomas defined Recreational Therapy as, “community reintegration, adaptive sports, and social engagement.” He briefly discussed how Recreational therapists assists with improving other domains as well. Medicare Treatment Caps: Outpatient treatment caps on Physical Therapy, Speech Therapy, and Occupational Therapy. Recreational Therapy wasn’t included because it is not independent billable. Skilled Nursing Facilities (SNF) were briefly discussed with the FY 2018 Final Rule. Inpatient Psychiatric Facilities (IRF) are retaining regulations for physical restraint use and seclusion. Peter Thomas said this is a good thing and Danny Pettry agrees. Rehab Research: ATRA is an active member of Disability and Rehabilitation Research Coalition. They advocate for increased funding for National Institutes of Health (NIH). Opioid Crisis: many people die. Some people who overdose and live have brain injury or other consequences that require rehabilitation. There is a big push for prevention. It isn’t the sole responsibility of the ATRA board of directions or Peter Thomas to do the work alone. The second part is a bit more difficult, but necessary.